You know nothing do you — some good did come from it — we met — we understand each other— that's enough. Irish-born Belfast native playwright Owen McCafferty has had many of his plays produced throughout Europe over the past twenty years. It was with Quietly that he he woulkd make an auspicious debut at Dublin's Abbey Theatre in 2012. This taut and tension-filled play set in post "troubles" Belfast would subsequently win an award at the Edinburgh Festival Fringe. It was also winner for Best Play from the Writers Guild Award in 2013. McCafferty may, nevertheless, have to wait a bit longer for a similar reception on this side of the pond even though his debut at the Irish Repertory Theatre will be recognized for introducing us to a fine writer with an an impressive gift for hyper intense realism. Director Jimmy Fay, who has been with the play from the beginning, compliments the intense slow-burning dramatics with unhurried skill. But he also doesn't soft pedal one character's stunning bursts of brutal physicality. Without making much ado about the difficulty I had understanding every word spoken by the actors,(from what I overheard, a diffiulty share by other audience members), the ear does, in fact, become receptive to the dense brogue and Belfastian cadence thrown at us. At its best, Quietly is an impassioned play filled with gritty unpretentious dialogue. And the three terrific actors now at the Irish Rep are splendidly recreating the vivid characters they previously played at the Abbey. The play unfolds during what's evidently a slow night at the neighborhood Belfast bar in 2009. In it 30-something barman Robert (Robert Zawadzki) is intently engaging himself with a poker machine while also watching a football match between Poland and Northern Ireland. A Polish immigrant, Robert has, naturally, taken sides, but is soon enough standing on the sidelines hoping he doesn't have play referee to an increasingly tense and testy match between two men, both aged 52 who , as we quickly learn, have arrived for an apparent showdown. 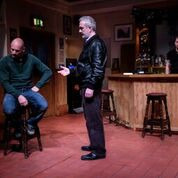 Jimmy (Patrick O'Kane) is Catholic and Ian (Declan Conlon) is Protestant and the bar is the designated place for what appears to be a time of reckoning and a place for resolution. .
As Jimmy, O'Kane is quite fearful looking with his shaven head and a belligerent physicality close too stalking, but we can also see furtive glimpses of an inner conflict. It is a riveting performance to be reckoned with at awards time. Conlon affects a more tentative and cautious demeanor, but is equally effective as Ian whose presence is marked by understandable apprehension. We learn that this rematch between the two national football teams is playing a significant part in the plot. It was in 1974 during a game between the two teams that a bomb was thrown into the bar killing all its patrons including Jimmy's father. Although we are told that Jimmy and Ian were both sixteen at the time and that Ian was a "soldier" of the Ulster Volunteer Force and Jimmy had joined the IRA. The historical revelation is suddenly given a contemporary resonance. The play suddenly becomes topical and timely as from outside the pub we can hear the racist rumbling about the Polish barman. It is a chilling reminder of how the climate of racism and intolerance and the threat of a terrorist attack has not significantly changed over the years. While a small portion of the plot involves Robert and his longing for Poland, the dramatic core of the play pertains to the back stories of Jimmy and Ian as expressed through their impassioned monologues. Most disquieting is Ian's impulsive romantic fling with a young women given to him as a prize following the bombing. . Most horrifying is Jimmy's memory of the pub after the bombing and the sight of its dead.Ultimately what is most memorable and ultimately remarkable is the way its protagonists proceed in an effort to seek a sense of closure, a goal that would seem to be virtually unattainable. The pub, as realistically designed by Alyson Cummins, might seem a rather unlikely place for a showdown and a resolution. But then again, this is Belfast.